One day, the Philistines were getting ready to fight with the Israelites. Saul and his army troop set up camps on a hill opposite of where the Philistines army set up their camps. At that time, the Philistines had a hero who is a giant called Goliath. Goliath came from the town of Gath.Goliath is 9 feet tall. Goliath always wears a bronze helmet, and bronze armor to protect his chest and legs. Goliath carries a sword which he always strapped at his back as well as a large spear. Goliath came out and challenged the Israelites army to fight with him everyday. David obeyed his father. Early the next morning, he woke up and loaded a sack of roasted grain, ten loaves of bread. After David had left the supplies with the man in charged, he ran up to the battle line to talk to his brothers to see if everyone is well with them. While David was talking to his brothers, Goliath came out again and showed off to them. 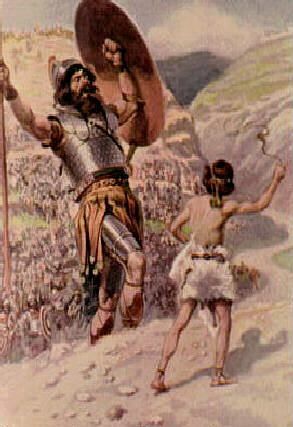 The Israelite armies were afraid of Goliath the giant and they backed off. The soldiers told David what King Saul will reward the man that kills Goliath the giant. Then David turned and asked another soldier the same thing. Some soldiers overheard what David was saying, and they told King Saul about it. Saul called in David and David came. Saul then gave his military clothes, armor, and sword to David. David put on the military clothes, armors and sword and walked around with it but he felt very uncomfortable. So David took off the military clothes, armor and sword and gave them back to King Saul. David picked up his shepherd stick. He grabbed a few small pebbles from the stream and put them in his leather sling back. Then David went off to fight with Goliath. Then David took a pebble and put it in its sling. David ran toward Goliath and swung the sling around. The pebble flew out and hit Goliath right in the head. It cracked Goliath’s skull. Goliath tumbled down and died.